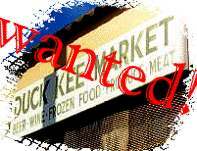 Thieves in Oakland, California, have ripped off the Duck Kee Market sign pictured on the "Willy and the Poor Boys" cover [September 1998]. Rick DelVecchio wrote an article on the theft in the Francisco Chronicle. He added: "I'd love to write that the sign has been recovered. My phone number is 510-433-5985; fax 510-834-5556." All the info about the two Live Albums released in June 1998. Look also for Real Audio and MPEG sound files from RECOLLECTION on this Website. All the John Fogerty / Creedence Clearwater Revisited Breaking News. Full report on the John Fogerty / Creedence Clearwater Revisited 1998 concert dates. The River-Rising is the largest CCR Mail List on the Net and it's free to join! Subscribe Now! Updates and the newest sections at the River Rising Web. Creedence Clearwater Revival History, Albums, Bootlegs, General Info. Stu Cook and Doug Clifford's revisitation of the classic band. All the other Creedence Websites you cannot miss. Cosmo's Factory [Stu & Doug's 1997 band] and John Fogerty in L.A in May 1997. EMAIL US YOUR EXPERIENCES, REVIEWS, IDEAS Even if you don't subscribe, you're welcome here! Thanks. This Site was started on September 20, 1996. The Mailing List was on-line in August the 28th. The Web Site Manager is Javier Diaz, Santiago - Chile. The Discography Consultants are Robert Aerts - Belgium, and Bruno Berthold, Qu�bec, Canada. "Born on the Bayou" River Rising theme performed by Bruno. The River Rising Web is made with the contributions of the Mailing List Subscribers. Our purpose is educational and non-commercial. Thanks.